As summer gives way to autumn, the light begins to change. This change in light has a metameric effect on the colour palate (that is, how colour absorbs or reflects different intensities of light). As the sunlight becomes weaker so too does the cheerful yellow and orange hues it naturally brings. When the sunshine starts to fade from our rooms, the colours inside appear darker and less intense making us feel drab. The world outside is changing to a swirling mass of scarlet, mauve and golden leaves, so let ani M INTERIORS show you how to do this autumn’s trends and bring some of these magical colours and patterns indoors. As willful and wicked as the famous Southern belle, this colour has the same allure. Its rich intensity is an autumnal favourite because it reminds us of ripe fruit, berries and falling leaves. Accessories come in a range of shades: plum, cranberry, burgundy and deep cherry which make the most of the fading light when paired with grey tones and soothing whites. 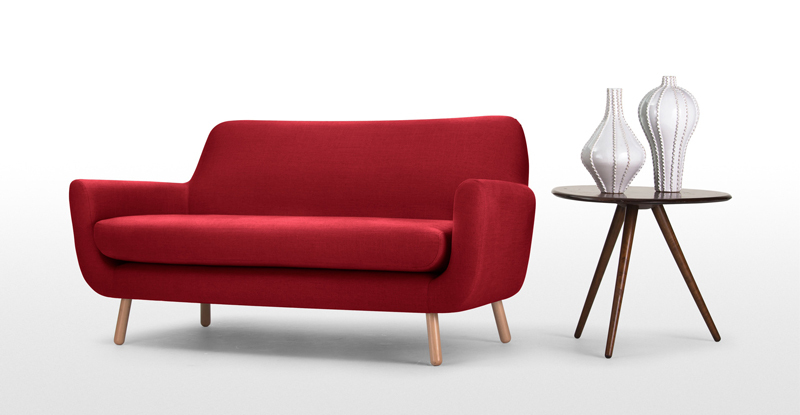 For statement pieces though, this plush, ruby three-seat Jonah sofa from Made.com is just perfect. The fashion houses and catwalks went wild for Oriental themes this year and the motif has filtered through to autumnal interiors trends. From Chinese lanterns and Thai bronze dragon ornaments to bath mats featuring tiger designs, the choice is bewildering. While these touches are great fun, it is a difficult trend to get right. A few tasteful touches will look sophisticated but overdo it and, at best, it can look cluttered and, at worst, tacky. If in doubt, follow the trail blazed by Orchid; its collections of antiquated Thai accessories are flawless. Imagine the bronze sculptures displayed on a sideboard in flickering candlelight as the autumn evening draws in. The ‘world traveller’ theme that has dominated this year’s interior trends and boho chic has made its way into most schemes. This time the emphasis is on home crafts. In echoes of the Scandi cool trend which saw embroidered and painted scenes from Scandinavian folklore, the soft furnishings and accessories of this autumn’s boho chic display handicrafts from cultures the world over. Painted Indian side tables, gypsy painted jugs and Peruvian-weave cushions and throws, it’s charmingly eclectic. 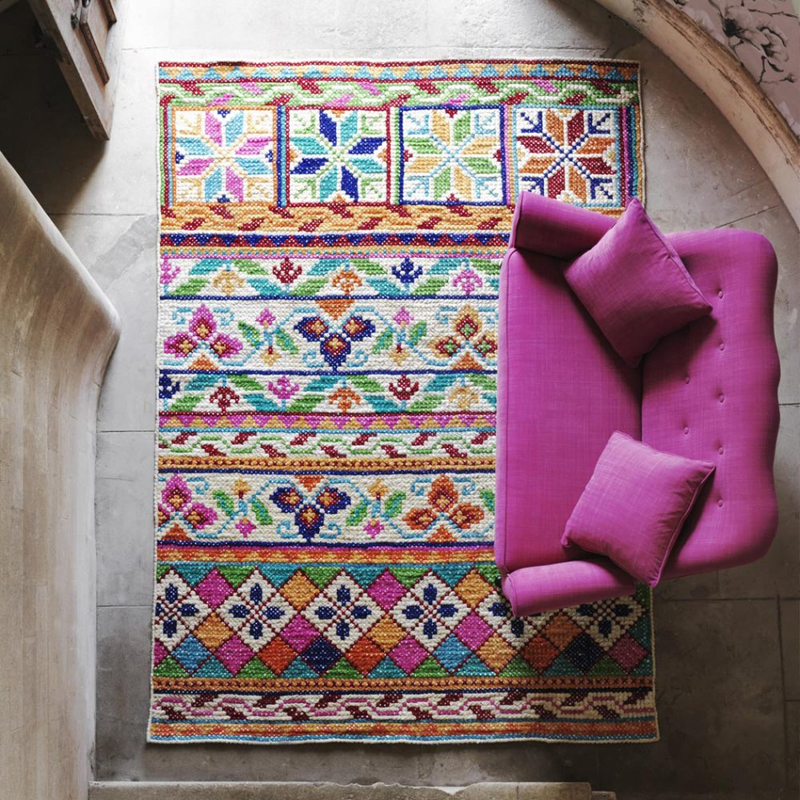 ani M INTERIORS top pick however, is this handmade, Dutch-patterned ‘Home Sweet Home’ rug from Graham & Green. In keeping with the handicrafts theme and the fact that as the temperature starts to drop our natural instinct is to hibernate, rugs cushions and throws start to fill our homes. Patchwork and quilting are natural bedfellows however, this theme is all about abstract collages of colour and pattern. Less homemade kitsch squares or hexagons, more sharp upholstery and edgy print pairings. 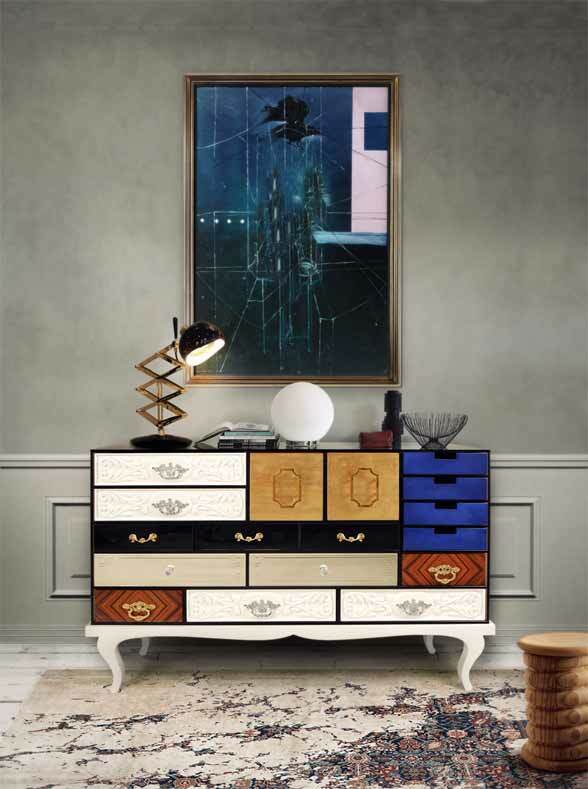 It isn’t confined to soft furnishings either, as this lacquered wood Soho sideboard from Boca do Lobo demonstrates; clever, grown-up patchwork style. This autumn’s trends are bursting with colour, vibrant pattern and evocative detail. As the light fades to cool blue hues, spice up your interior with sultry colour, shimmering touches of the Orient, folksy motifs and edgy collages. If you would love to try these trends but aren’t confident about getting them right, contact the team for guidance and inspiration.